I got another chance to tag along with my Bride as we were going to another board meeting and this time it was going to be out near the wine country of Michigan and I was excited. We got there the night before the board meeting was to begin, and my Bride and some of the other people decided to have dinner away from the resort that evening, as they were hoping that the evening away would curtail “shop talk.” I just go with the flow and try to make the most of the occasion. I was also looking forward to seeing our old friend “The Caller” as he was attending the meeting as well. The restaurant was The Fusion and it was located in Frankfort, and it was a very busy place. In the past I have been to many a restaurant that uses the term “fusion” and to me, it means that it is Continental dining with an Asian Rim accent; well I was surprised, as it was more an Asian Rim restaurant. I was like a duck out of the water, I mean, I could not make sense out of the menu and most of the dishes were out of my realm of understanding. The restaurant was getting more packed as we were there, and most of the others that we were having dinner with, have been there before, and were excited to revisit a dish that they enjoyed in times past. The service was exceptional, I just had no idea what I was going to eat and our waiter informed me about my allergy to MSG and told me that there was only one dish I could not order and I appreciated it very much. Everyone was ordering appetizers, so I saw something called Crab Rangoon, which sounded rather safe, it turns out it was some sort of crispy dough with cream cheese, but I could not detect any crab, so I passed the rest of the plate around for others to enjoy. They did have a half duck dinner with a choice of sauces and I opted to have it done with a garlic sauce, and it came with rice and vegetables, so I figured I was safe. It also came with a soup, and when I looked at the soup choices, there was not anything that sounded like a soup that I knew, but our waiter insisted that I should order something and maybe someone else at the table would enjoy a second soup, so that was fine with me. When the main courses came, everyone was thrilled and enjoying their meal. My duck dish was appetizing in appearance, though I am not quite sure what some of the vegetables were, but it was fine, but I did skip the rice, as it was not fluffy rice, like I am used to. I can not even try to explain what everyone else was having, but I was in a majority of one for the evening. My Bride was having a wonderful time; she even requested a set of chopsticks to use, as she claimed that she doesn’t often get a chance to use those utensils when she is out with me. We had fortune cookies after the meal, and it was suggested that everyone read the fortune, but add “in bed” as the last two words and there was a lot of laughing at the readings. The Caller chided me a bit after dinner, and said that I should have sat next to him, and he would have found some dishes that I would have enjoyed, in all honesty the duck was delicious, but I was still hungry and when we got back to the resort, I had to stop at the tavern and I ordered a quick burger, because I was still hungry, but I survived. There were a lot of cocktails being ordered especially before dinner, and my Bride was enjoying a Cucumber Martini, and all I could think of, was that she was trying to find an alternative to her Pimm’s Cup. We had a nice bottle of wine with dinner that I guess went with most of the dinners. We had a bottle of Louis Bernard Cotes du Rhone 2012. Louis Bernard is a relatively newcomer to the Rhone as he started in 1976 and is currently striving to be an organic vintner. The wine was a classic Rhone wine and I would venture to say that it is a classic mix of Grenache, Syrah and usually Mourvedre; though it can also have some of the following varietals for the Century Club crowd of Carignan, Cinsaut, Clairette, Counoise, Muscardin, Terroir Noir and/or Vacarese. A fine time was had by everyone and the restaurant was still packed and more people coming in, as we were leaving, so I guess it was just me and my parochial views on food and my Bride was happy. 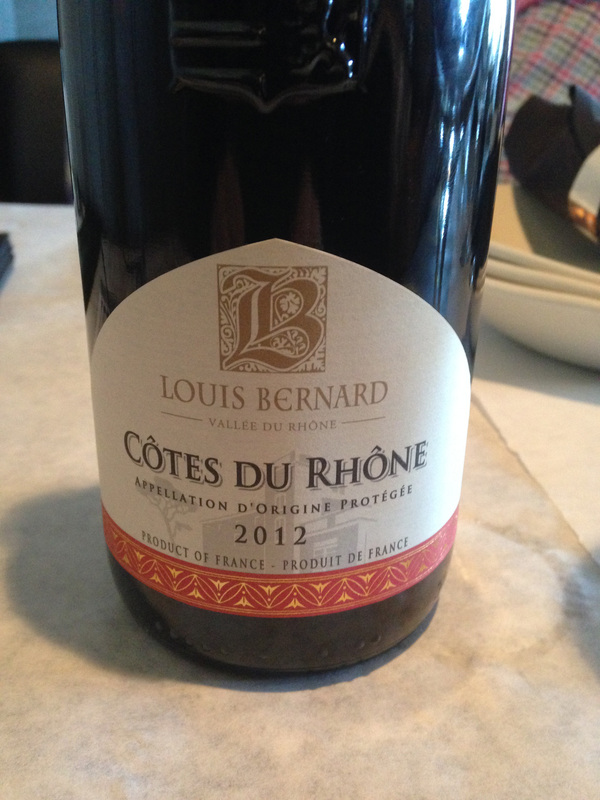 This entry was posted in Dining, Wine and tagged Cotes du Rhone, France, Grenache, Louis Bernard, Mourvedre, Syrah. Bookmark the permalink.